What are your chances of getting into Oxbridge? This Thursday will see thousands of students across the country receive their A-level or Higher results. Come September, half a million freshers will embark on three years of Pot Noodles and alcopops (and perhaps some studying in between). Just a fraction of those – around 7,000 – will take places at Oxford or Cambridge, two of the UK’s most prestigious institutions. Both universities have known for a long time that they have a diversity problem, and have taken steps to address it. But how far have they come? And what are your chances of getting in? 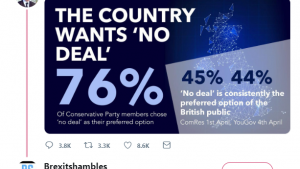 FactCheck takes a look at the stats. The average Oxbridge applicant has a 1 in 5 chance of success. Cambridge received 16,750 applications for the academic year starting in September 2016. 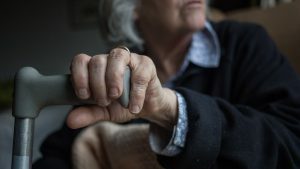 They made 4,307 offers, of which 3,457 were accepted (“accepting” a place means that you got an offer and later, got the grades you need to take it up). The latest figures from Oxford show the university received slightly more applications – around 18,300 – and accepted 3,200 undergraduates. That means both universities receive around five applications for every place. But what happens when we break these figures down by ethnicity and school background? If you’re a white UK applicant, you have a 1 in 4 chance of getting in – slightly better than the average student. In 2015-16, Cambridge received just over 7,200 applications from white “home students” – i.e. UK residents. Of those, 2,037 took a place. The most up-to-date data we have from Oxford on ethnicity is from 2013. It shows that of the 8,700 white applicants that year, 2,233 accepted places. 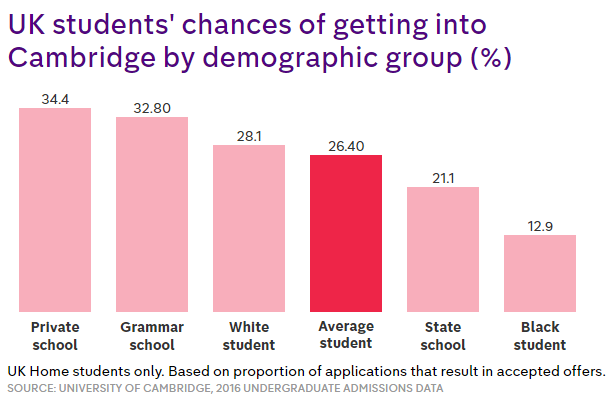 That means that the average white student applying to Oxbridge has a 1 in 4 chance of getting a place. Around 1 in 8 black students get a place at Oxbridge – half the success rate of white applicants. In 2013 – the latest year we know about – 218 black British students applied to Oxford, of whom 29 took places the following September. 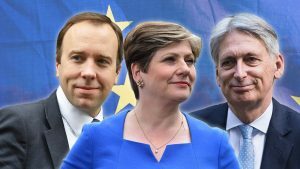 “Black applicant” here means a student from the UK who identifies themselves as one of the following three categories: “Black or Black British – Caribbean”, “Black or Black British – African” or “Other Black background”. The latest figures from Cambridge are from 2016. In that year, 302 black British students applied, of whom 39 were successful. If we put the latest available stats from both universities together, we estimate that an average of 13 per cent – or around one in eight – black British applicants get a place at Oxbridge. Overall, a white UK resident is twice as likely to get into Oxbridge as a black British student. Other ethnic minorities do better. The success rate at Cambridge in 2016 for UK students of Chinese heritage is 33 per cent. 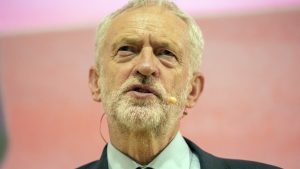 People that describe themselves as “Asian or Asian British – Indian” also do better than the average applicant, with a 29.9 per cent success rate. What about the school you went to? In 2016, just over 25 per cent of applicants from UK private schools got places at Oxford; at Cambridge, that figure was much higher at around 34 per cent. On average, then, a private school student has a 28.7 per cent chance of getting into Oxbridge. That’s only slightly more than the average UK student. Based on data from Oxford’s 2016 statistics, we estimate that the average state school student has a 19.6 per cent chance of getting in. Unfortunately, this data isn’t broken down further, so we can’t tell how many of those students are from comprehensive or grammar schools. Cambridge does provide more detailed information. From this, we estimate that 21.1 per cent of comprehensive school students end up receiving and accepting offers. Grammar school students do rather better at Cambridge, with a 32.8 per cent success rate for applicants. Overall, then, it’s a mixed picture for schools. At both universities, private school students outperform state applicants. 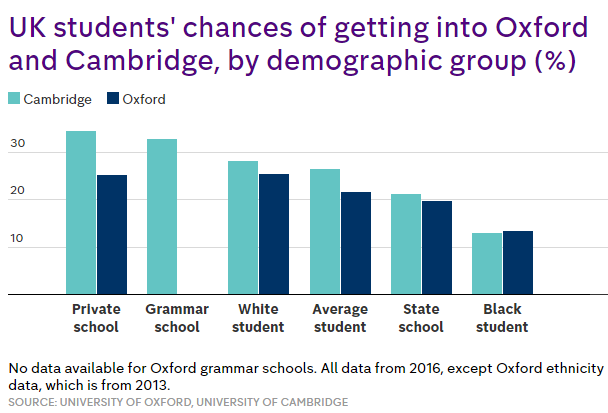 But curiously, this data suggests that a grammar school student has a better chance of getting into Cambridge than a private school student has of getting into Oxford. The same could even be true at Oxford, although they don’t provide equivalent data. The graph below shows another strange effect of this phenomenon. When we take an average position across the two universities, private school students appear to perform worse than grammar school students overall. One in every five applicants to Oxbridge will take up a place. 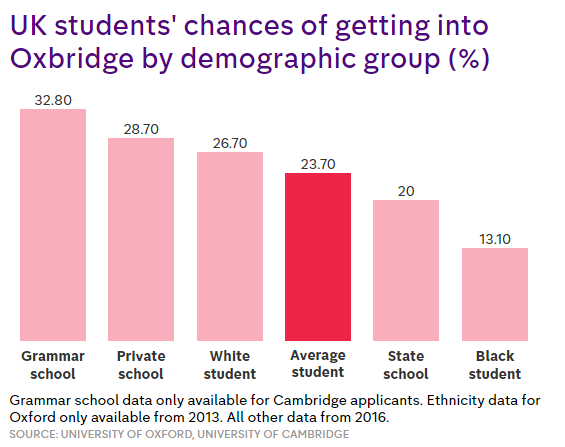 White applicants are twice as likely to get into Oxbridge as black students. Grammar school students do especially well at Cambridge. At both universities, private school applicants do better than those from state schools. 16 August: We’ve updated this article to correct a typo. It previously stated that there were 16,000 white applicants to Oxford in 2013. That figure is actually 8,700.